Western Red Cedar is known for its extremely fine and even grain, its flexibility and strength in proportion to its weight. Western Red Cedar is a species of wood whose lumber can be used in a variety of ways. Western Red Cedar is renowned for its high impermeability to liquids and its natural phenol preservatives, which make it ideally suited for exterior use and interior use where humidity is high. The cellular composition of Western Red Cedar, millions of tiny air-filled cells per cubic inch, provides a high degree of thermal insulation, approx. 1 R/inch. Old Growth Western Red Cedars' slow growth, dense fiber and natural oily extractives are responsible for its decay resistance and its rich coloring, which ranges from a light milky straw color in the sapwood to a chocolate in the heartwood. Second growth Western Red Cedar is different. It is a stable wood that seasons easily and quickly, with a very low shrinkage factor. It is free of pitch and has excellent finishing qualities. Western Red Cedar is Bear Creek Lumber's main inventory item. Offered in siding patterns, paneling patterns, and boards for board-on-board siding, trim, and fascia. Bear Creek also carries Red Cedar decking, Red Cedar timber and beams, and Red Cedar shakes and shingles. Additional grades and sizes are available upon request. Photo: above left: Weathered Red Cedar Beam and Red Cedar Channel Siding. To get a quote on Western Red Cedar products, click here. Shakes and Shingles for siding and roofing offer added property value at an affordable cost. Western red cedar is a premium material for post and beam and timber frame homes. Warmth and elegance comes with the added value of wood interiors. When ordering your Cedar products it is important to understand lumber sizing. Lumber is generally going to be sold on what is called Nominal Sizing rather than Net Sizing. An example of this would be to order a 2"x4". Though the board is nominally called a 2"x4" its net size may be 1.5" x 3.5" if it has been surfaced on all four sides. If you need a particular net size of material, please be sure to make your sales representative aware of the exact net size so he can provide you with the right piece of lumber. Note: all pictures are meant for a general grade description. If you want to see a more defined grade image, please let us know. We can email you pictures and further explanation of grades. Clear Vertical Grain - Pieces may exhibit a few minor characteristics which do not detract from their high appearance and quality. Limiting provisions include: very light torn grain, very light skips on the non-graded face and very light warp. C & Better Clear - Pieces of this grade are of sound wood. Most pieces are entirely clear or have only a few unimportant characteristics such as: medium stained sap wood , short splits, small pitch streaks and occasional small knots. Select Tight Knot - The basis for this grade are the knots, burls and naturally occurring markings which are of fairly uniform distribution and add to the decorative character of the piece. Sound, tight knots: star checked and/or slightly chipped knots permitted. Bear Creek Lumber can offer other grades depending on the type of product ordered. Boards, timbers, paneling, bevel, etc all have slight variations to their grades, so it is important to understand what you are ordering. If you are not certain on the grade you are being quoted, feel free to ask your sales representative for additional information. It is also important to be aware that if you are getting quotes on different grades of the same product that you are sure which grade you are purchasing at the time of sale. Each grade has different characteristics and allowances for trim backs, so when you sign your purchase agreement it is imperative that you understand which grade you are going to be receiving. Note the different colors above. Red cedar, like any other wood, has a range of colors. On special orders we may able to match colors at an extra cost. The characteristics that make Western Red Cedar a fine exterior siding, decking, and paneling, also make shake and shingle products the most desirable for roofing and sidewall application. Briefly, we will look at the difference between shakes and shingles and their applications. View Shingles In Application. Shingles are sawn. Shakes are split. Shingles have a relatively smooth surface while shakes have at least one highly textured natural grain split surface. Shingles and shakes make of Western Red Cedar are generally used for roof and sidewall applications in the natural or unfinished state. Photo Caption: (right) This house features shake siding. Wood siding is among one of the best ways to enhance the look of a house. The exterior finish of a building is the face it presents to the world. It defines the mood and character of the structure and reflects the image desired by its designers, builders or owners. Western Red Cedar siding is available in a range of designs and grades, offering the variety and versatility to complement any architectural style. It adapts equally well to bold and expressive modernism or the well defined criteria of period styling. 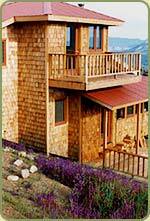 Above all, Western Red Cedar has an enduring beauty that projects an aura of prestige. It is a wood with great dimensional stability and natural decay resistance. Its freedom from pitch and resin makes it an excellent base for a wide range of finishes. Common patterns for siding include tongue and groove, channel, pattern 105 or board and batten. Custom patterns can be created with our specialty milling options. Incorporating a deck into your home is a great way to add value the home, increase your living space and to better your overall quality of life. Western Red Cedar is great for decking as it is easy to work with, has a pleasant aroma and is durable yet not hard and unyielding. Red Cedar decking can come in a variety of sizes, but the most popular are 5/4x4, 5/4x6, 2x4 & 2x6. Bear Creek Lumber can offer this cedar decking in random lengths of 6' and longer and can also sell in specified lengths, which will often create premium pricing if specified in long lengths. When we talk about Western Red Cedar paneling we are not talking about 4'x8' sheets, but rather tongue and groove, shiplap or similar materials that can be used to panel your walls and ceilings. Red Cedar is a great choice for indoor use as it has a nice color range of wood tones, has a pleasant but not overpowering aroma and works in both humid and dry environments. We can offer the Western Red Cedar paneling in clear and knotty grades, allowing for our clients to adjust what they order based on their individual budget. The most common widths for paneling are going to be nominal 4" and 6", but we can product narrower or wider patterns through out specialty milling options. Common tongue and groove patterns will include V2E, V4E, edge and center bead, or center match. Custom patterns can be created with our specialty milling options. The field of construction using solid sawn Western Red Cedar timbers is greatly diversified. It covers many types of engineered structures; commercial, industrial, and residential buildings; and landscape structures such as bridges, arbors, pergolas, gazebos, field houses and the like. In general, applications can be classified into two very broad use-groups: first, for those structures such as large buildings in which both the strength and appearance of exposed wood members are of equal importance; and second, in landscape, park and garden structures where appearance is paramount. For both use-groups, Western Red Cedar offers the advantages of natural beauty, design flexibility, exceptional dimensional stability and long term durability. Cedar has a long history of withstanding the rigors of time and weather. It is also recognized structural material with known mechanical and physical properties. These attributes allow the design of timber structures of all types using basic engineering principles and stress-or appearance-rated grades of Cedar. Real wood trim on residential, commercial or industrial buildings perfectly complements any architectural style and is compatible with all contemporary cladding materials. The ideal wood for trim is Western Red Cedar. Its dimensional stability, longevity, ability to accept a wide range of finishes, resistance to decay and natural good looks make it the only sensible choice for base boards, corner boards, fascia, skirting and window and door trim. Western Red Cedar trim boards are available in Clear and Knotty grades. Trim boards are often available in Surfaced Four Sides (S4S) Surfaced One Side Two Edges (S1S2E) or Rough Sawn textures. Although Western Red Cedar is naturally durable, a surface coat is recommended to protect the wood and extend its service life. Cedar accepts a wide range of stains and other coatings and whichever is selected should be a good quality product recommended by a paint or building supply dealer. When selecting a finish coat, make sure it contains the following: water repellent, Fungicide/Mildwcide, Protection against ultra violet light. Penetrating oil-based products, particularly those containing pigments, are recommended for Cedar. Pigments provide increased UV protection. Hot-dipped galvanized, aluminum and stainless steel nails are all corrosion-resistant and all can be used to nail Western Red Cedar. Other types of nails, such as electro-plated, are not recommended. They can rust and disintegrate and react adversely with the natural preservative oils present in Cedar, resulting in stains and streaks. Copper nails also react with Cedar and should not be used. Stainless steel is the best choice but hot-dipped galvanized is the most widely used and economical. 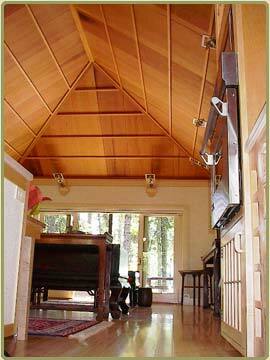 Above: 1x24 Western Red cedar custom ceiling paneling, also featured are Alaskan Yellow Cedar Timbers. Fancy Cut Shingles Patterns Available , shown above : Diagonal, Half Cove, Diamond, Round, Hexagonal, Octagonal, Arrow, Square, Fish Scale. Hip/Ridge available to Match all of the above.